Have you ever felt like your boss (or company in general) doesn’t understand your needs? This ability to understand another person's feelings is called empathy, and when other people understand your feelings, your life is easier and more rewarding. This is true in all aspects of life, but you may feel it keenly in the workplace. If your boss–or company–lacks empathy toward you, you're experiencing an empathy gap. According to the 2018 State of Workplace Empathy Report, Businessolver found that 96% of the responders stated that empathy was an essential value for companies to demonstrate to their employees in the workplace, but 92% believe empathy remains under-demonstrated and undervalued. What is the Gender Empathy Gap? The empathy gap is the difference between how you think people feel and how they feel. You can have an empathy gap in your own mind. For instance, signing up for a gym membership because you want to get in shape. The gym has classes and equipment that you are sure you’ll love. After you pay your money and sign a contract for your membership, you start to go to the gym, and you find that you hate it. This is called the “hot-cold” empathy gap. When you sign up, you are in one state (cold) thinking your membership will be great, reduce your stress, reduce your waistline, and perhaps even help you to meet new people. But when you actually go to the gym, you are in a hot state. It turns out that you find working out while other people are near you or watch you is stressful so your waistline won’t budge. How you thought you’d feel turns out very differently from how you actually feel. This is, undoubtedly, the cause of so many unused gym memberships, unread self-help books, and abandoned paleo diets. An empathy gap at the office often occurs when the boss thinks people will feel one way, but they feel another. A typical example is when a small business owner devotes every waking hour to her business and expects her employees to do the same. She loves the business, wants it to succeed and makes every sacrifice necessary for the business’ success. The employees, however, see the business as a place of employment. They may also love their business and want it to succeed, but they also want to go home at 5:30 p.m. and not think about it again until 8:00 a.m. the next morning. This can cause conflict between the boss and the employees. The boss wonders why people aren’t working as hard as she is and the employees think their boss is an unreasonable taskmaster. The disconnect is the empathy gap. And, the empathy gap can adversely affect women more than men. In the study cited above, employees feel that workplace empathy is improving. But, they also demonstrate that a gender gap exists between how men and women feel. Only 70% of women feel that their employers are empathetic as compared to 85% of men. How Does the Gender Empathy Gap Affect Women in the Workplace? Men and women have different priorities (generally speaking, of course). Women, for instance, prefer temporal flexibility over higher pay, while men will sacrifice time away from home for a bigger paycheck. A company that’s run by people who value money above all else will reward its employees with raises and bonuses. But, a company that's run by people who value temporal flexibility may provide smaller paychecks but offer telecommuting, part-time work, and flexible schedules. Because more men statistically are found in leadership roles than women, and because men have shown a preference for money over flexibility, you may experience an empathy gap between what the employees want and what the management offers. Offerings such as maternity leave, nursing rooms, and childcare are often factors that attract and help retain women; but those benefits aren't a priority for everyone. Even a woman whose children are in high school may not empathize (she’s in the cold state) with a woman who is trying to maintain her milk supply while working full time (in the hot state). 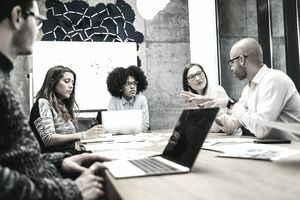 What Can HR Do to Help Close the Empathy Gap? Just knowing an empathy gap exists is the first step towards closing the gap. After all, the empathy gap is merely another form of unconscious bias. If you realize that not everyone has the same needs, wants, and priorities as you (or the CEO) have, you can start working to solve the problem. But, proceed with caution: do not ask employees to respond to a survey if you don’t intend to act on the information you receive. If you know that your employees' value X and you not only don’t give them X but you don’t even address why you’re not, it’s not just an empathy gap, it’s cruelty. You may find convincing senior leadership that change is needed difficult. But, if HR can present the data in a business fashion and discuss the return on investment, you can increase the probability of making the changes your employees want to happen. Explore your heart, not just the head. Picking just one of these opportunities and working on it can help grow your empathy and close the gap. But, as an HR manager, you can also use these tips to help your employees. While Sobel talks about travel as a way to get out of your environment, you can use tip number two in the workplace by implementing cross-training programs. If you teach the finance people about marketing and vice versa, both groups can gain empathy for the other group, allowing for a better relationship. Additionally, you can teach tip eight, ask better questions, through training. If a person gives a presentation and then walks away, without questions, people don’t have the opportunity to gain a better understanding. You can help participants learn how to ask better questions and help presenters learn how to ask questions of the audience. It’s most helpful for both groups to understand each other. Senior leadership does need to understand what their employees experience, but the employees need to understand how leadership thinks. This will reduce tension. As an HR person, you should also point out problems with the empathy gap when you see them. For instance, if the boss announces that no money is available for bonuses this year, but then shows up driving a new sports car, the employees will feel that he doesn’t care about them. He may not care or the car may be a gift from a rich uncle. But, the damage is done regardless of the source. A savvy HR person can help the boss see how this is problematic. More empathy expressed in your work environment will help your employees feel valued, and that will help them succeed. When they succeed, your organization succeeds. What Can HR Do to Help?